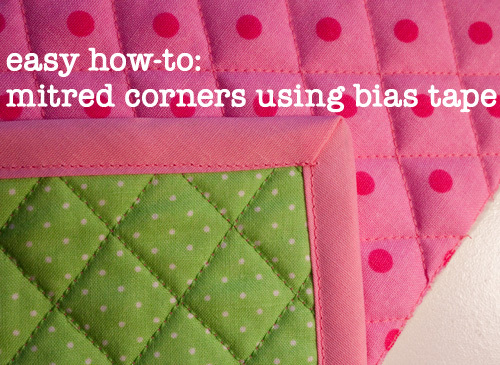 For some reason, I always thought that making mitred corners using bias tape would be really tricky. It turns out it’s super simple! Now you have no reason to fear binding around corners… using this tutorial, you can put bias tape on potholders, pockets, collars, you name it! Bias tape is just such a cute touch. This tutorial utilizes double-fold bias tape. First, you want to have your fabric ready. This means if you want it quilted, you’ve already finished all that. 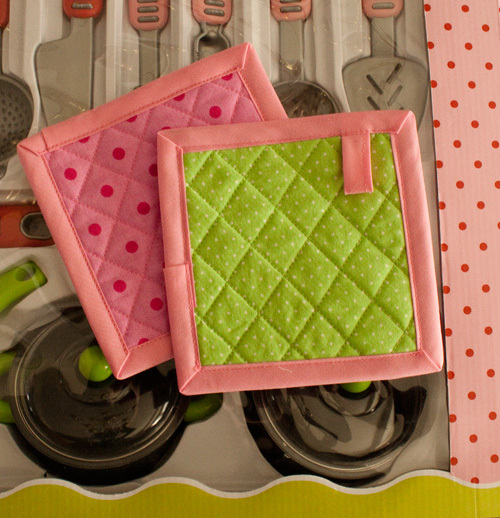 Trim your edges to make sure all your corners are sharp, perfect 90-degree angles. Then cut a piece of bias tape that is long enough to go around all four sides of your piece, with some extra to overlap at the end. It’s harder to start with the end, so I like to start somewhere in the middle. 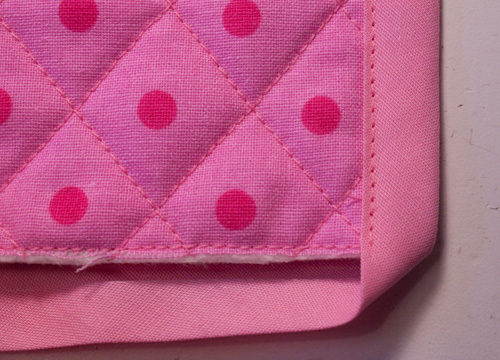 Usually I fold the tape in half to find the center, then place that in the center of one of the sides. That’s the side I start with. Step 1: See how your bias tape is folded in half? One of these halves is more narrow than the other. 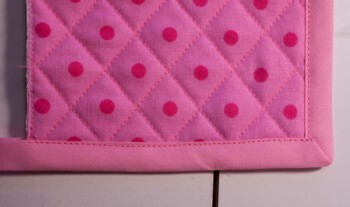 Place the more narrow side on top: this ensures that the underside is caught even if your fabric is a little bit thick. Make sure the tape is on straight, then sew all the way down your first side. …and Step 3: play with your corner until it looks like a pretty, clean mitred corner on both sides! At this point I like to give it a quick “stay there!” press with the iron… pins don’t do too well since there are too many layers and they just end up shifting things around. 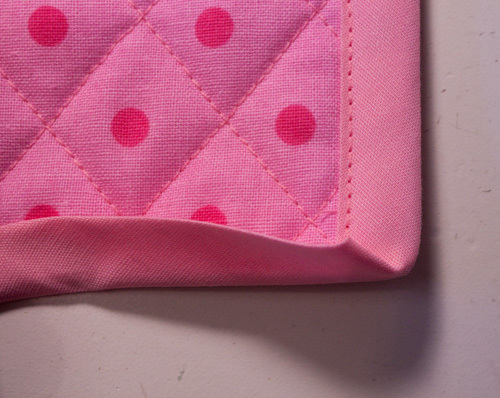 Step 4: Sew all the way down your next side, starting with the anchoring stitch at your corner. Continue for all four sides! Congratulations on some beautiful bias tape work! This is a great tutorial. I love how you explain it so simply! I’ll be linking to this in my next tutorial needing bias tape instead of explaining it myself because you do a stellar job!! And your pics are beautiful!! Thank you for this tutorial. It is very clear! Thanks for the tutorial. 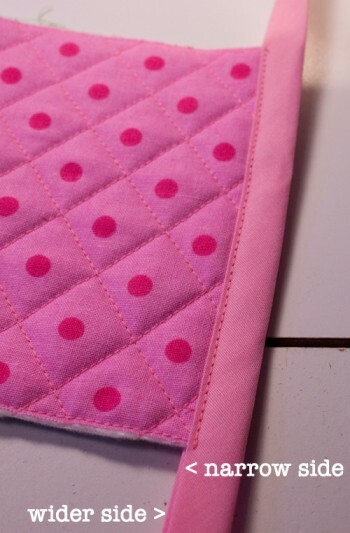 I’m a learner still, I’m trying to learn to sew by my self. Thank you for this very helpful tutorial. Now that I see how simple it is, I can’t believe I didn’t figure it out years ago! Now if I could just learn how to finish off lace at the ends! I make aprons as gifts and I just wish I could do a better job and make them look more professional! Thanks a bunch! THANK YOU so much for this. I was struggling this morning with edging for my Valentine’s placements. I wanted to use red bias tape but couldn’t get the corners right. You saved me so much hassle. Thanks! Thanks! 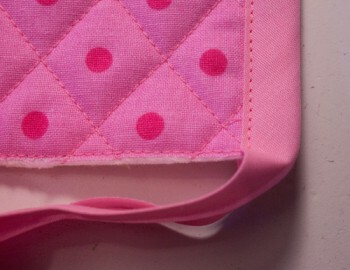 Making apron with matching pot holder…couldn’t remember how, and now I do. Isn’t Pinterest wonderful?!! !